Valkyries receiver Tori Giles is taken down by two Riot defenders. The Saskatoon Valkyries experienced a few not so good firsts on Saturday night. Taking on the rival Regina Riot, the Valkyries suffered their first loss ever on home turf, and it came in a definite fashion. The Riot thrashed the four time defending Western Women’s Canadian Football League champions 49-9 at Saskatoon Minor Football field. The loss ended a 17 game home winning streak for the Valkyries, and it also included another couple of dubious distinction. The Valkyries set new team records for most points allowed in a single game at 49 and largest margin of defeat at 40, which has been the only time Saskatoon has been blown out. Before Saturday’s outing, the Valkyries only lost one other time in a team history that dates back to 2011 falling 15-7 to the Riot in Regina on May 12, 2013. The Riot have built a reputation on giving the Valkyries tough games. The Valkyries regularly thump the rest of their other opponents. As much as the Valkyries can look at their latest loss to Regina as one of those nights where everything that could go wrong did go wrong, the Riot have to be given full credit for their strong effort. In the first encounter between these two squads back on May 17 in Regina, the Valkyries rallied from a 16-8 deficit to earn a 28-19 victory. The Riot had to lament a number of missed opportunities they had to win that contest and a number of drive killing dropped passes they committed. Valkyries receiver Marci Kiselyk loses the handle on a pass reception. Saturday’s encounter didn’t appear it would be romp by the visitors early on. Just 1:34 into the contest, running back Sam Matheson ripped off a 29 yard touchdown run to put the Valkyries up 7-0. A large crown at SMF Field had to anticipate an 18th straight home victory. The Riot then rolled off 21 unanswered points to go up 21-7. Quarterback Aimee Kowalski hit her sister and receiver Alex Kowalski on a four-yard pass to tie things up at 7-7. Tailback Carmen Agar ran in a major from 15 yards out late in the first quarter and backup signal caller Sami Bray scored on a one-yard quarterback sneak early in the second quarter to give Regina a 14-point edge. Even at this point in the game, the Valkyries didn’t appear to be in trouble. They cut the gap to 21-9 after the Riot conceded a safety. After Saskatoon defensive back Shantel Stupnikoff recovered a fumble by Agar, the Valkyries drove deep into the Riot’s end of the field. On a third down gamble, Valkyries quarterback Stacey Boldt tried to connect with receiver Marci Kiselyk on a corner pattern in the end zone, but the pass attempt hit the upright. Regina proceeded to drive down the field. On the last play of the half, Aimee Kowalski’s end zone pass deflected off the hands of intended receiver Amanda Hungle and into the hands of Alex Kowalski for a major score from nine yards out. The positive bounce allowed the Riot to take a 28-9 lead into halftime and ended the competitive part of the contest. In the second half, the Valkyries seemed to battle through a drop in confidence, which was visible in dropped passes and blown assignments. Riot tailback Carmen Agar motors away from a couple Valkyries defenders. Regina continued to play strong. Agar ran in a major from 30 yards out, Aimee Kowalski hit Hungle with a four-yard TD strike and running back Carly Kentz capped the scoring with a one-yard plunge. With the win, Regina improved to 2-1, while Saskatoon fell to 2-1. The Riot also holds the standings tiebreaker over the Valkyries outscoring their rivals 68-37 in the two head-to-head contests. The two teams top the WWCFL’s Prairie Conference standings. The Valkyries close the regular season this coming Sunday, when they travel to Winnipeg to take on the Manitoba Fearless. The Riot will also be in Winnipeg to close the regular season this coming Sunday taking on the Winnipeg Wolfpack. With the loss, the Valkyries quest to win five straight WWCFL titles is not over. Odds are high Saskatoon and Regina will meet in the playoffs once again in the Prairie Conference final for a fifth straight year. In a likely rubber match, the Valkyries will have had three weeks to get their confidence back, so a result can’t be guaranteed for one side or the other. The WWCFL rivalry between Saskatoon and Regina definitely has some intrigue for the rest of the 2015 campaign. The 37th Annual Saskatchewan Marathon proved to be memorable for all those that took part. Early Sunday morning at Diefenbaker Park in Saskatoon, about 3,000 runners participated in racing in one of four different distances including a five-kilometre race, a 10-kilometre race, a half-marathon and a full marathon. Most of the competitors had the aim of testing themselves on their own personal basis, and ultimate victory was achieved in finishing the race. In the full marathon, Sergii Vashurin of the Ukraine finished first overall running just over 42-kilometers in a time of two hours, 37 minutes and 55 seconds. Local product Erin Gardiner won the women’s division in the full marathon run for the second year in a row and posted a time of 3:00:21 on Sunday. Ruslan Kramariuk, another product from the Ukraine, won the half marathon in a time of 1:15:05. Saskatoon product Amanda Froelich topped the women’s division in a time of 1:27:00. In the 10-kilometre race, Ivan Heshko, the third product from the Ukraine taking part in the overall event, claimed the men’s division in a time of 33:03, while Christina Charles of Prince Albert took the women’s division in a time of 37:11. In the five-kilometre race, Ibrahim Mohammed of Saskatoon won the overall race in a time of 16:25, while Melfort’s Robyn Luthi claimed top spot in the women’s division in a time of 19:47. Offensive lineman Brendon LaBatte takes part in a Riders training camp drill. In the province that is well known for its wheat fields, it seems like the CFL off-season can’t end soon enough, as everyone seems anxious to throw on their Roughriders jerseys for another campaign. The Saskatchewan Roughriders got going again holding a two-day rookie camp on Wednesday and Thursday in Regina. The team’s main training camp officially opened on Sunday at Griffiths Stadium in Saskatoon as 91 players took the field for workouts. During the afternoon session, the stands on the west side of Griffiths Stadium were almost full of members of Rider Nation, and the majority were sporting their green and white jerseys. You can expect similar gatherings at Griffiths Stadium for the rest of the week. Early on in camp, Roughriders fans will be wondering how Darian Durant’s right elbow has healed up. Durant injured his elbow in a 30-24 road victory over the Blue Bombers in Winnipeg on Sept. 7 of last year and was out for the rest of the season. Saskatchewan was 8-2 when Durant was hurt and finished the 2014 campaign with a 10-8 regular season mark. In the playoffs, the Roughriders were eliminated in the West Division semifinal with an 18-10 loss to the Eskimos in Edmonton. Durant is also learning a new system, because Jacques Chapdelaine was brought in during the off-season to replace George Cortez as team’s offensive coordinator. Sights will also be set on receiver Nic Demski, who played last season with the University of Manitoba Bisons. The Riders selected Demski in the first round and sixth overall in the CFL Draft that was held on May 12. A whole host of familiar veterans were also on hand including offensive lineman Brendon LaBatte, receiver Chris Getzlaf, defensive lineman John Chick and defensive back Tyron Brackenridge. Camp also receivers Preston Bews and Evan Turkington, who both played in the Canadian Junior Football League last season. Bews helped the Regina Thunder win the CJFL title in 2013, while Turkington helped the Saskatoon Hilltops capture the CJFL championship last year. Most of the Roughriders on field sessions this week at Griffiths Stadium are set for 8:30 a.m. and 3 p.m., but their training camp schedule is subject to change. Julene Friesen (#14) charges to the end zone after catching a pass. When Julene Friesen stopped trying to prove herself, she gained a lot more joy out of playing tackle football. After graduating from the University of Saskatchewan Huskies track and field team in 2013, Friesen wanted to try something completely new and joined the Saskatoon Valkyries of the Western Women’s Canadian Football League. Having experienced a lot of success as a middle distance sprinter for the Huskies, Friesen was driven to prove she belonged with the Valkyries. As rookie running back on a team that had won the first two WWCFL titles, Friesen was frustrated at times with the growing pains she endured. “It was something completely new, and I wasn’t feeling much success at the start,” said Friesen, who stands 5-foot-5. “I was so used to individual sports and having all the pressure on me that it took me awhile to realize that I can have teammates block for me. By the end of the 2013 campaign, Friesen had helped the Valkyries win a third straight WWCFL title. She took 2014 off from playing tackle football, because she wanted to try her hand at beach volleyball and running 30-kilometre races. At the U of S, the distances Friesen ran were a lot shorter being commonly between 400 and 800 metres. While the former track star stepped away from football, Friesen’s confidence did grow as her first campaign progressed with the Valkyries. She rejoined the team this season with a new appreciation for the sport. Julene Friesen (#14) celebrates a TD with Marci Kiselyk. In high school, Friesen played touch and flag football. Her biggest influence in helping her improve her skills then was physical education teacher Darla Lee-Walde. Friesen and Lee-Walde were Valkyries teammates in 2013. Growing up, Friesen saw the contact version of the sport from the stands on a frequent basis, because her older brother Mitch played. Mitch would go on to suit up with the Saskatoon Hilltops of the Canadian Junior Football League and the Huskies football team. Julene’s interest in tackle football also grew due to the fact her boyfriend is Kit Hillis, who played for the Hilltops and is the Huskies all-time leader in career receptions. Hillis exhausted his eligibility with the Huskies last season. As a member of the Huskies track and field team, Julene wasn’t allowed to play tackle football, because her U of S track coaches were concerned about her getting injured. Friesen joined the Valkyries about a month after she graduated from the Huskies track program, and she also learned playing tackle football wasn’t like the touch and flag versions of the sport. Friesen’s confidence showed in the Valkyrie first two games this season. 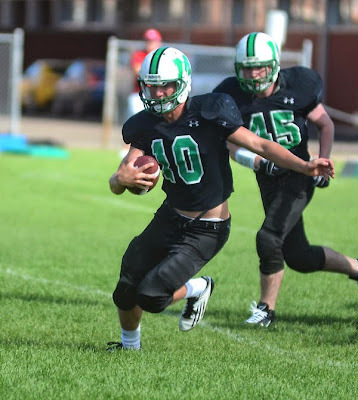 In a 75-0 romp over the Winnipeg Wolfpack on May 10 at Saskatoon Minor Football Field, Friesen scored touchdowns on runs of 46, 62 and 17 yards and hauled in another major on a 55-yard pass play. On May 17 at Mosaic Stadium in Regina, Friesen had a big performance against the host Riot. Down 16-8, the Valkyries rallied for a 28-19 victory, and Friesen accounted for the last two Saskatoon touchdowns coming off a 13-yard outlet pass and a tough eight-yard run. Julene Friesen charges through the line for the Valkyries. Friesen was pleased with how her team performed and how she played in a very physical contest against the rival Riot. “The whole game just felt like a battle, and it was so fun to be in a game rather than feeling so far ahead that it didn’t even really feel like a competition,” said Friesen, who works as a teacher in Langham. “I had a lot of fun, but it was definitely challenging. The Valkyries have won all four WWCFL titles that have been handed out dating back to 2011, but the Riot have always provided a good test. Saskatoon’s only loss in franchise history came on May 12, 2013 against the Riot in Regina by a 15-7 score. The Valkyries (2-0) and the Riot (1-1) face each other again on Saturday (7 p.m., SMF Field). Friesen expects to keep playing for the Valkyries in future seasons, but in the present, she gets pumped up for games against teams like the Riot and is looking forward to Saturday’s clash. “It is going to be unreal,” said Friesen. “I can’t wait to play them at home with our crowd behind us. Stacey Boldt gets set to unload a throw for the Valkyries. Besides talking to Friesen, I also caught up with new Valkyries starting quarterback Stacey Boldt. A third-year member of the team, Boldt had big shoes to fill as the starting signal caller, because she followed in the steps of Candace Bloomquist, who led Saskatoon to its four straight league titles as the starting quarterback. My story on Boldt appears in this week’s edition of the Saskatoon Express, which can be found by clicking right here. I appreciate the fact that editor Cam Hutchinson contacts me to write for the Express on a fairly regular basis. The staff there is outstanding to work with, and I recommend that readers check out the rest of the stories and columns in the weekly Express publication as well. Neal Hughes gets pictured with a couple of small fans in 2011. Neal Hughes' football journey started rather innocently enough with a hint of the determination that would define his career. 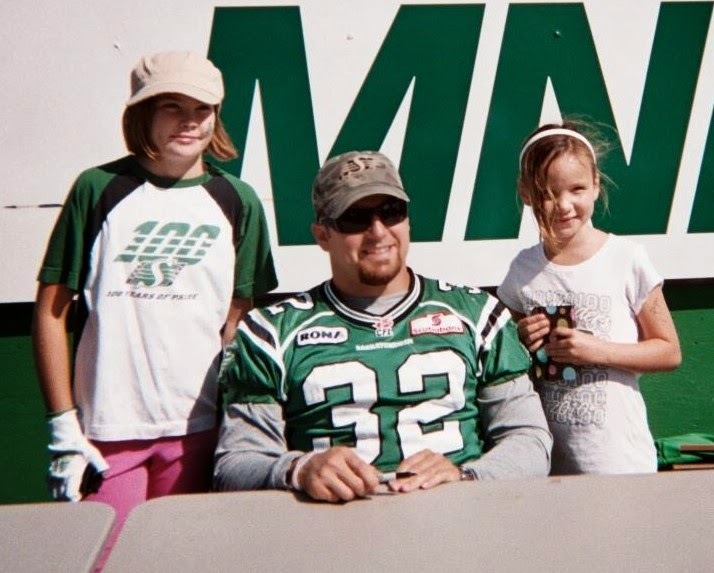 Long before he played fullback for 11 seasons with the CFL's Saskatchewan Roughriders, Hughes was just your typical Regina born boy who had dreams of suiting up for the Green and White one day. Growing up, his favourite Riders players included Tim McCray, Tom Burgess, Willis Jacox, Orville Lee, Jeff Fairholm, Don Narcisse, Eddie Lowe and Bobby Jurasin. Hughes often wore Jurasin's trademark bandanna. At age seven, Hughes learned about a minor football team in his Regina community called the Razorbacks from a friend. After making this discovery, Hughes asked his parents, father Bill and mother Phyllis, if he could play football. Bill told his young son he was still too small to play that sport and the answer was no. Plus, the son was still a year too young at the time to play minor football in the city. A short time later, he got his hands on an application form to join the Razorbacks. He filled it out on the hood of his parents' car and listed himself being nine-years-old. After that step, Neal broke the news to his parents about his football adventure by showing up at the family home with equipment issued by the Razorbacks. A Saskatchewan football star was born. Bill and Phyllis let their son stay in minor football that season. Little did they know, Neal would play football until making his retirement from the Roughriders official on Wednesday, which was about six weeks shy of his 35th birthday. Back in his first season in the Regina minor football ranks, Neal was the smallest player on the Razorbacks. The team's coaches and players used to get a kick out of watching him catch multiple long ball passes that were thrown his way during one practice session. From that start, Hughes moved up the local football system and joined Regina's Thom Collegiate Trojans in Grade 10. He became a Regina high school football star at running back and relished taking part in the Argyle Street rivalry between Thom and the Archbishop M.C. O'Neill Titans. The two high schools face each other across Argyle Street. 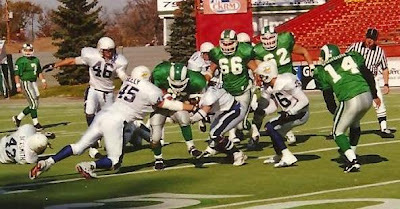 Neal Hughes plows into to the line for the Regina Rams in 1998 CJFL action. When it came time to join the post-secondary ranks, Hughes didn't leave his hometown. In 1998, he became a prized recruit of the defending Canadian Junior Football League champion Regina Rams, who introduced the tailback at a press conference held at their old clubhouse located at Scotty Livingstone Field on the north end of town. The Rams were embarking on their final campaign as a member of the CJFL before joining the Canadian university ranks in what was then known as the Canadian Interuniversity Athletic Union and is now known as Canadian Interuniversity Sport. Hughes stepped on to the Rams practice field in training camp and immediately began ripping off long runs against the team's starters. It was obvious that Hughes was going to make an immediate impact with the storied Rams franchise. He blossomed into a star helping the Rams finish first overall in the Prairie Football Conference with a 7-1 record as a tailback and kick returner. He suffered a broken leg when the Rams downed the Saskatoon Hilltops in that year's conference final. As a result, Hughes watched from the sidelines as the Rams thumped the Okanagan Sun 36-13 in the CJFL championship game, the Canadian Bowl, at Taylor Field. Hughes was spectacular for the Rams in five seasons at the university level. He is still the team's career leader in rushing yards (2,934), rushing touchdowns (17) and all-purpose yards (5,667) in university action. 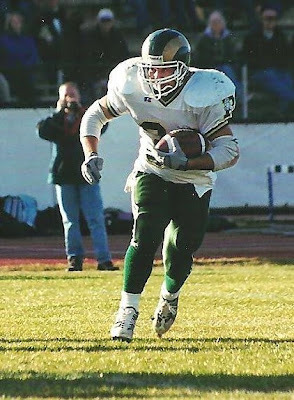 Neal Hughes bursts downfield in 2001 for the U of Regina Rams. He scored the game-winning touchdown in the final seconds of the 2000 Canada West final on a 10-yard outlet pass on a third and goal situation to give the Rams a 25-22 victory over the host U of Manitoba Bisons. In total that day, Hughes caught 10 passes for 206 yards, returned four kickoffs for 102 yards, rushed six times for 28 yards and returned two punts for nine yards. His most memorable game came in the 2000 Atlantic Bowl. The Rams were attempting to make the Vanier Cup in only their second season of university play, but they fell behind the host Saint Mary's University Huskies 36-24 about halfway through the fourth quarter of the semifinal bowl contest. After the Huskies scored a major to expand their edge to 12 points, Hughes returned the ensuring kickoff 89 yards for a touchdown, which included bouncing off a group of four tacklers and charging home to daylight through an open lane. The Huskies conceded a safety to further cut their edge to 36-33, and Hughes returned that ensuing kickoff to Saint Mary's 12. Rams quarterback Darryl Leason hooked up with receiver Chris Warnecke for a TD strike to give the Rams a 40-36 victory. The Rams would fall in the 2000 Vanier Cup 42-39 to the U of Ottawa Gee Gees. Off the field with the Rams, Hughes, who stands 5-foot-10 and weighs 208 pounds, developed a reputation of being a player you wanted in the community representing your team. He also became fast friends with a large number of athletes from all of the other University of Regina Cougars teams. The Rams kept their name when they moved to university football. During his years with the Rams, the football rivalry between the cities of Regina and Saskatoon was quite intense, and despite the harsh feelings that sometimes arose, Hughes was respected by those involved with the Hilltops and the University of Saskatchewan Huskies. Neal Hughes runs the ball for the Rams in 2003. While he accomplished a lot with the Rams, there were no guarantees that Hughes would have a career at the CFL. When Hughes finished his time with the Rams, it wasn't a common practise for CFL teams to take a chance on Canadian born running backs. A lot of times, those running backs were converted to be fullbacks, but it was custom for those careers to run three or four years. 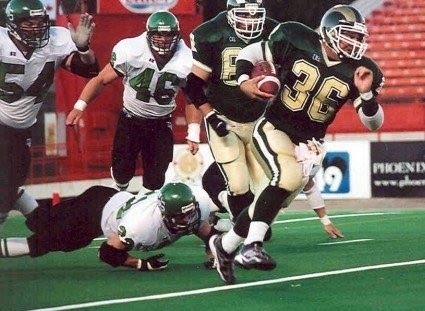 Hughes was invited to Roughriders training in 1999 under junior territorial rules due to the fact the Rams hadn't played their first university level game. Even that invite didn't guarantee a possible future playing in the CFL. 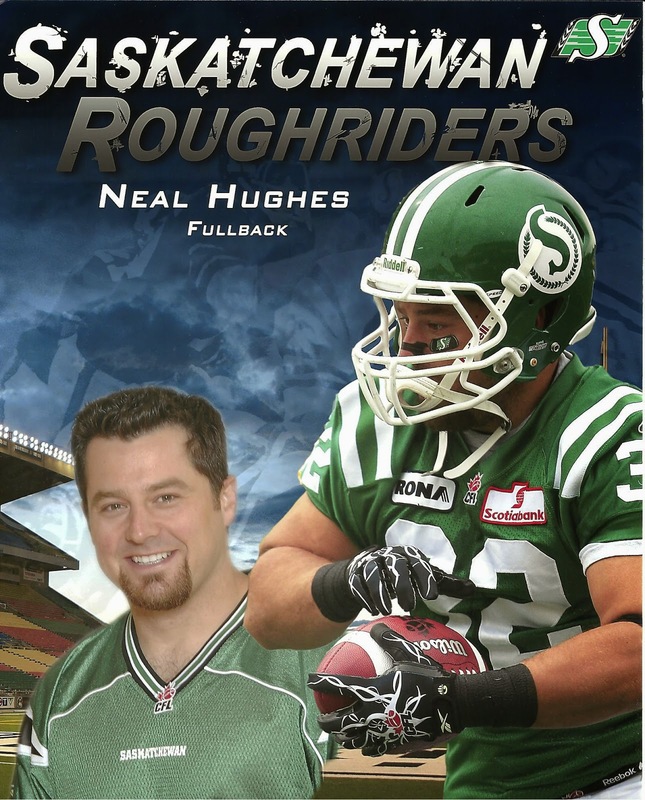 After no one selected him in the 2004 CFL Draft, Hughes signed as a free agent with the Roughriders. He ended up playing in 14 regular season games and both of the Roughriders playoff contests in that rookie campaign. During training camp, Hughes proved he was versatile showing that he could run the ball, be a receiver, return kicks and cover well on special teams. In Week 10 of the 2004 campaign, Hughes replaced an injured Paul McCallum as the team's punter and averaged 35.0 yards on two kicks. He remained with the Roughriders through the end of the 2014 campaign being a member of two Grey Cup championship teams in 2007 and 2013. Through his CFL career, Hughes mainly focused on blocking duties as a fullback or from a tight end position and covered kicks on special teams. The home-grown product did get a handful of chances to produce yards as a rusher or receiver. The biggest offensive highlight came in the 2007 West Final, when Hughes hauled in a two-yard scoring reception on a play action pass play to provide the winning points in a 26-17 victory over the host British Columbia Lions. That would be his only major score in CFL post-season play. 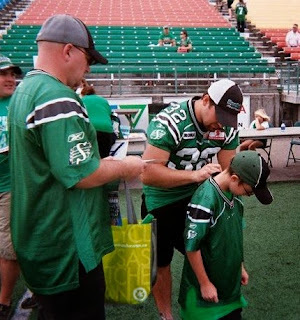 Neal Hughes signs a young fan's jersey in 2010. Hughes quickly became popular with his teammates and was a fan favourite throughout his career. Like his days with the Rams, he was one of the Roughriders best representatives in the community engaging in numerous charitable and community activities. As he moved into the later years of his playing career, Hughes never lost his boyish joy in being a member of the Green and White. After the Roughriders downed the host Calgary Stampeders 35-13 in the 2013 CFL West Final, Hughes, at age 33, was super excited about the victory. The grown man had the enthusiasm of a little boy, and he still cherished the privilege to be living his dream. 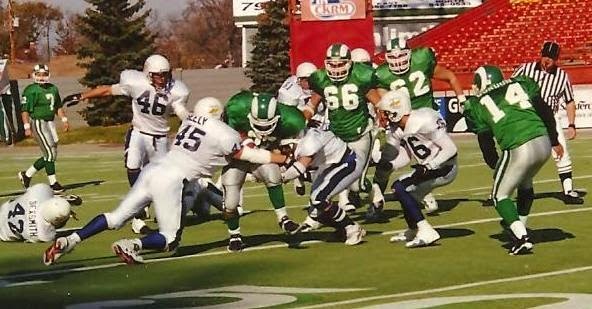 Having lost the opportunity to play in the 1998 Canadian Bowl at home because of injury, Hughes eagerly anticipated the chance to play the 2013 Grey Cup at home in the storied facility now known as Mosaic Stadium. The 101st Grey Cup on November 24, 2013 was a fairy tale night for Rider Nation. Playing in front of a sellout crowd of 44,710 spectators at Mosaic, the Roughriders blasted the Hamilton Tiger-Cats 45-23. 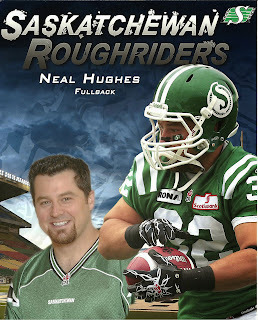 A Roughriders' promo picture of Neal Hughes. Hughes carried the ball three times for 32 yards in front of his hometown crowd. It appeared he might get to record a touchdown in the game's final seconds, but the team knelt down to end the contest to allow victory celebrations to start in earnest. The win was obviously the most memorable night for Hughes in his hometown park. With the excitement of how the 2013 campaign ended, it didn't seem like 2014 would be Hughes final year in the CFL. Dogged by various injuries to his foot, the veteran was limited to playing just two regular season games and last suited up on July 5, 2014 in a 48-15 blowout loss to the Argonauts in Toronto. Entering free agency after playing in the league for 11 seasons and having missed significant time in the last year of his contract due to injury, the likelihood was high that the 2014 campaign could be Hughes' last in the CFL. After officially announcing his retirement, Hughes could walk away with no regrets. He turned the Saskatchewan dream into a reality and also earned two Grey Cup rings in the process. No one can question the fact that his run was a good one. Quinton Slack tears downfield during a Mohawks practice in 2012. The name "Medicine Hat High School Mohawks" brings out a vast array of positive images. When that name is mentioned, the first pictures turn to football with head coach Quinn Skelton guiding the Green and White to another big win. He has been the Mohawks head coach for 25 seasons and was named the NFL Canada youth football coach of the year in 2008 due to the positive impact he has had on his players. 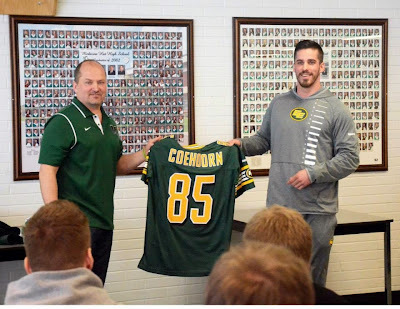 You also see players that carry themselves with class including offensive lineman Dan Federkeil, who played for the NFL's Indianapolis Colts and is now with the CFL's Calgary Stampeders, and receiver Nathan Coehoorn, who plays with the CFL's Edmonton Eskimos. Both have returned to Hat High to either help with football camps or give great life building speeches for players. Their professional jerseys hang in the trophy case located in the school's main entrance. Hat High rosters in recent years included quality individuals like Quinton Slack, who was a starting quarterback and is now just focusing on post-secondary studies, and running back Tristen Getzinger, who is a recruit of the University of Saskatchewan Huskies. Both are the perfect examples of the type of people you want in the community representing your program, because all they do is make the team look good on so many levels. While the Mohawks football program is usually the first team that comes to mind when one thinks of Hat High, athletes and coaches involved with all the other teams at the school also come away with similar high quality experiences. The girls teams go by the moniker of "Kwahommies," which is a cute play coming off spelling Mohawks backwards. 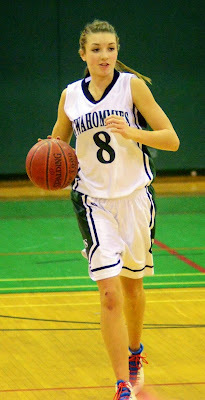 Grade 11 point guard Isabel Rattai helped the Kwahommies senior girls' basketball team win the 4A Alberta Schools Athletic Association title in March, and she has been a gem away from the court. A starter since her Grade 10 season, Rattai gives big support to the rest of Hat High's teams at rallies, and she is spectacular when it comes to interacting with young players that play her sport. The teachers and staff at Hat High do a stellar job of helping their students excel academically, so they are prepared to move on to the next step of their lives in a trade or moving on to post-secondary studies. The Hat High Mohawks logo. Being associated with the Mohawks and Kwahommies teams is the aspect that makes the high school experience that much more special. Hat High has had a long time feeling over decades where being a member or supporter of one of its teams is something you take with you for the rest of your life like memories of doing the "Cha Cha Slide" during halftime of games at the Methanex Bowl in the Gas City. For most alumni and alumnae of Hat High, they will always see themselves as Mohawks and Kwahommies. That is the type of attachment all athletic teams try to achieve, but only few do. Hat High's athletic teams have achieved that type of attachment. It is common for Hat High grads to post their team's logo on items like hard hats, helmets in the military or clothing years after leaving high school. Unfortunately, a specter finally caught up to Hat High. Over the last 15 years in North America, a large number of teams that have had a moniker linked to a First Nations culture have changed their team nickname due to concerns about racism. The successful holdouts have mainly consisted of professional clubs in the NHL, NFL and MLB. In the view of political correctness, the general sense is that using any term linked with a First Nations culture as a team name is not appropriate unless the team is made up of players of First Nations descent. The only program immune from that political correctness generality is the Florida State University Seminoles of the National Collegiate Athletic Association due to the fact the Seminole Tribe of Florida has officially sanctioned that post-secondary institution to use the names and images associated with Seminole history. Mohawks HC Quinn Skelton, left, with Nathan Coehoorn in 2014. In an interesting twist, the Seminoles track team features Hat High grad and Canadian Olympic hopeful Sage Watson, who is a standout sprinter in the 400-metre dash and 400-metre hurdles. She also has reputation of being an outstanding and modest person. Despite all the things that surround the Mohawks and Kwahommies teams, news came out of Medicine Hat recently that Suzanne Tripp, who is a Grade 12 student at Hat High, has started a petition to have the school change the nicknames of its sports teams or specifically the "Mohawks" name. Tripp told CBC that she felt that the use of Hat High's team monikers represented First Nations people as "terrifying and savage." She also said the "Mohawks" nickname didn't make sense geographically, because the Mohawks tribes were from the area that spans the present day eastern Ontario to southern Quebec. There is concern that Tripp's petition alone would be enough to eliminate "Mohawks" and likely "Kwahommies" as names for Hat High's teams. Isabel Rattai of the Kwahommies. In 2014 in Saskatchewan, Regina's Balfour Collegiate and Saskatoon's Bedford Road Collegiate both ceased respective use of the nickname "Redmen." In both cases, "Redmen" originally was used to signify the team's colours and First Nations logos were added later on. Both schools also have storied histories with their athletic teams. The push to change the name of "Redmen" at Bedford Road took on a bigger life in 2011, when Erica Lee, a Bedford Road graduate, made a Facebook page calling for the change. It is a move that draws parallels to what is happening currently in Medicine Hat. Balfour Collegiate changed its name on the recommendation of an elders advisory council set up by the Regina Public School Board. The advisory council was formed in March of 2014 when heat was building up regarding the use of the "Redmen" name by Bedford Road. When you talk to people in the streets in Regina and Saskatoon, the notion often comes up the minority won out over the majority regarding the elimination of the use of the "Redmen" name. In Medicine Hat, the petition calling for the end of the use of the "Mohawks" name has been met with a petition calling for a stay in the proceedings on changing the moniker or basically a call to allow Hat High to keep its team nicknames. The petition was started by Rick Preikschas, who is a Hat High alumnus from the Standoff reserve. The fact remains that before Tripp started her petition, the words "terrifying and savage" have never been used in association with Hat High's teams. The Medicine Hat High School Mohawks and Kwahommies are frequently associated with the words "pride, honour and class." If the Mohawks First Nations people, who are located a lengthy distance away from Medicine Hat, wanted to give sanction to Hat High to use the "Mohawks" moniker, it would be a good thing. Julene Friesen speeds downfield for the Valkyries. It was a rare sight to see the Saskatoon Valkyries at the wrong end of the scoreboard. It also gave the four time defending Western Women's Canadian Football League champs a chance to show their resiliency. On Sunday at Mosaic Stadium, the host Regina Riot jumped ahead of the Valkyries 16-8. The Riot had a habit of giving their Bridge City Rivals tough contests, which included a 15-7 victory over the Valkyries on May 12, 2013. It wasn't out of the question Regina could pull out its second victory over Saskatoon in 13 tries. Like a squad that is used to winning championships, the Valkyries battled back. The Riot lead shrank to 16-14 by halftime. Saskatoon proceeded to jump ahead 21-16 with 52 seconds remaining in the third quarter, when first year starting quarterback Stacey Boldt hit tailback Julene Friesen on a 13 yard outlet pass for a major. Victory wasn't assured until Friesen ran in the game's final touchdown from eight yards out to give the visitors a 28-18 lead with 66 seconds remaining in the fourth quarter. Saskatoon came away with a 28-19 final after Regina concluded the scoring with a rouge coming off a missed field goal as time expired. Unlike a lot of the contests involving the Valkyries, Sunday's game with the Riot provided intrigue. Saskatoon is the model franchise in the WWCFL and has run away from opponents with numerous blowout victories. The lopsided results occur due to a combination of the fact the Valkyries are well run with a strong coaching staff, and the WWCFL is still in its formative years. Women's tackle football is still a relatively new sport experiencing growing pains. The Riot have run a strong program, and they could have easily come away with a victory Sunday had the outcome of two or three plays been changed. The battle between Saskatoon and Regina showed the potential of how interesting WWCFL games can be. Aimee Kowalski slings a pass for the Riot. The Valkyries jumped ahead 8-0 thanks to the Riot conceding a safety in the first quarter and Boldt hitting veteran receiver Marci Kiselyk for a 34-yard pass and run TD strike early in the second quarter. Regina sputtered early offensively due to a number of dropped passes but proceeded to catch fire. Riot quarterback Aimee Kowalski hit receiver Claire Dore with a 20-yard scoring pass cutting the Saskatoon lead to 8-6. A two-point conversion attempt by Regina to tie the contest failed. After Valkyries receiver Tori Giles fumbled away a punt return, the Riot were in business again. The turnover resulted in a 22-yard field goal from Morgan Turner to put Regina ahead 9-8. With 1:58 remaining in the second quarter, Aimee Kowalski connected with her sister Alex Kowalski for a long 75-yard home run strike to put Regina up 16-8. At that point in the game, the Riot had all the momentum and were making the majority of the plays. The Valkyries tightened things up scoring just 45 seconds later, when Boldt hit Kiselyk from eight yards out to cut the gap to 16-14. A two point conversion attempt failed, but Saskatoon was successful in stopping Regina's momentum. After Boldt connected for her third touchdown pass of the game to Friesen to put the Valkyries up 21-16, the Riot didn't go away. Near the halfway point of the fourth quarter, Regina had a golden chance to go back in front, but Aimee Kowalski's end zone pass to open rookie receiver Rachelle Smith was dropped. The Riot proceeded to turn the ball over on downs, but the Valkyries had to concede a safety on the ensuing series shirking their edge to 21-18. Regina would be doomed from two more mistakes. While running downfield after a catch, Alex Kowalski fumbled the ball away near her own 35 after getting tackled by Valkyries defensive back Amber Buchholz and linebacker Beth Thomson. Thomson recovered the ball for the visitors. Valkyries DB Carisa Polischuk, right, takes down Riot receiver Diane Nesbitt. It appeared Regina would hold Saskatoon to scoring just a field goal, but the Riot were penalized for contacting Valkyries kicker Rienna Rueve. The infraction gave the Saskatoon a first down, so the visitors took the field goal off the board by accepting the penalty. The Valkyries proceeded to run more time off the clock before Friesen ran in for the clinching major. Regina attempted a last play field goal in case the points were needed for a standings tiebreaker down the road, but settled for a single. With the win, the Valkyries improved to 2-0, while the Riot fell to 1-1. After a bye weekend, these two clubs meet again on Saturday, May 30 at 7 p.m. at Saskatoon Minor Football Field. Regina needs to win that contest by 10 or more points to claim the season series. With that in mind, hopes are high that the next clash will be as compelling as Sunday's match was. If you have any comments about this blog, feel free to email them to stankssports@gmail.com. To see more photos of the Valkyries victory over the Riot, check out Twitter @StanksSports. The Saskatoon Hilltops in action at SMF Field in October of 2014. The money dried up when the turf went in, and now there a final fundraising push. Back in 2013, The Friends of the Bowl Foundation not-for-profit group launched a forward thinking initiative to make much needed upgrades to Gordie Howe Bowl here in Saskatoon. The hope was to raise just over $11-million to allow the renovations of the home field of the Canadian Junior Football League's Saskatoon Hilltops and the Western Women's Canadian Football League Saskatoon Valkyries to become a reality. In 2014, Gordie Howe Bowl was renamed Saskatoon Minor Football Field, and facility reopened with a new field turf, video scoreboard, sound system and upgraded lighting thanks to fact $7.6-million was raised for upgrades. With those improvements, the fundraising came to a bit of a standstill, because there was a perception everything was complete, when the new field turf field was put into use. On Tuesday at a press conference in Saskatoon, The Friends of the Bowl Foundation announced $10-million has been raised to date with private and public sector commitments, and a "Seal the Deal" campaign has been launched to secure the last $1.5-million to complete the upgrades. The money that still needs to be raised will be used to finish off the clubhouse complex going up on the south end of the stadium and to renovate the plaza entrance area to create new ticket booths. "We're not done yet," said Bryan Kosteroski, who is the chairman of the Friends of the Bowl Foundation. "We need a little bit more to finish this off. "The second floor is going up. The rafters will be going tomorrow. We will start some of the inner work. We still need some funds to finish off the second level off totally." Out the funds that still need to be raised, $1-million will be used to finish off the clubhouse and $500,000 will be used to renovate the plaza entrance area. Thanks to the upgrades that have already been completed, SMF Field has already had 1,000 hours of rentals booked at all levels of football, which equates to a 600 per cent increase in hours of usage from 2013 before any of the upgrades were started. "We have teams from Outlook and rural communities all over the place coming here," said Johnny Marciniuk, who is the operation manager for Saskatoon Football Incorporated. "They are all enjoying our turf here. Monday's are kind of a touch football day. We have our girls Rush program, our high school rush through Saskatoon Minor Football on Tuesdays. "Wednesdays is our adult flag (day). Thursdays is our six-on-six program. Fridays and Saturdays, we have had Eastside soccer here and Hollandia soccer that have used the facility. The new clubhouse complex that is under construction at SMF Field. "We are really pleased about this, because this is multipurpose, and we want to make sure that everybody has access to this facility, and it is not just a football facility. That is one of the things that we are very proud of this year." When completed, the new 12,000 square foot clubhouse will have four main locker rooms, four softball locker rooms, a referees' training centre, film rooms, meeting rooms, offices, a softball umpires room, therapy room, equipment storage and a multi-purpose room with a viewing balcony. The SMF Field is part of the Gordie Howe Sports Complex in Saskatoon, which also includes eight softball diamonds, five baseball diamonds including Cairns Field, a speed skating oval and a hockey rink. Last Saturday, Kosteroski gained a new appreciation for how busy the facility can get with the upgraded SMF Field as the parking lot for the complex filled up. "We had a softball tournament, (and) there is football going on," said Kosteroski. "There are so many people coming out here and the awareness is growing. That is why we wanted to launch this next campaign was to seal the deal here. This will be one of the top facilities in Canada." Kosteroski said funds are needed as soon as possible to meet the construction timeline. Recognition opportunities are still available like field logos, naming of locker rooms and the multi-purpose room overlooking the field. Donations to the campaign can be made online at www.turfit.ca. Former Rams head coach Frank McCrystal. Face it Saskatoon football community, you are already missing Frank McCrystal. When the University of Regina Rams face the University of Saskatchewan Huskies on Sept. 18 at Griffiths Stadium, it will feel like something is missing, when McCrystal is not out there pacing the sidelines as the Rams head coach. 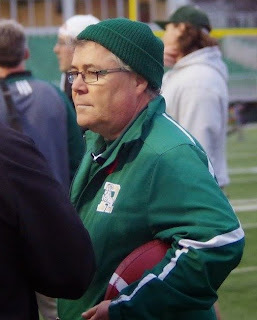 McCrystal retired at the end of last season following 41 years of involvement with the Rams program including five years as a player, five years as an assistant coach, 15 years as head coach of the team in their Canadian Junior Football League days and 16 years in the Canadian Interuniversity Sport ranks. As Rams head coach, McCrystal was good at stirring the pot to elevate the rivalry between Regina and Saskatoon. During the Dogs' Breakfast fundraiser for the Huskies, a few McCrystal jokes flew through the air that one almost forgot he no longer coaches the Rams. When you head to a football activity in Saskatoon, it seems like someone brings up a memory of McCrystal, which included his vow to run for mayor of Saskatoon after the Rams upset the host Saskatoon Hilltops 46-27 in the 1997 Prairie Football Conference final. As it stands, the Rams will take the field under the guidance of new head coach Mike Gibson. The new head coach was also given the ability to form his coaching staff. So far, the Rams will return five coaches from last season and bring in four new coaches. Notable departures include offensive coordinator Bernie Schmidt and receivers coach Rick Seaman, who both had long tenures with the Rams. Even some of the support staff personnel won't be back for a season ago including video coordinator Kevin Baron, whose ties to the Rams date back to being a player starting in 1997 in their second last CJFL campaign. As far as stories are concerned coming out of the Regina media, Gibson is trying to put his stamp on the team, and it feels like there is an effort to create a distance from the old coaching regime. It also feels like the colourful interviews McCrystal gave will also disappear. As far as early impressions go, Gibson, who was an assistant coach in the CFL for the last 10 seasons, will likely be more sterile in his media interviews like Bill Belichick, who is the famed head coach of the NFL's New England Patriots. Expect the more colourful tell it like it is football interviews in Saskatchewan to be reserved for Hilltops head coach Tom Sargeant and Huskies head coach Brian Towriss. A new era has arrived at the post-secondary level in the province. When the Rams and Huskies collide in the Bridge City, football fans in Saskatoon will realize things will be a little less colourful. Quarterback Stacey Boldt throws a TD strike for the Valkyries. It feels like it was love at first site for Saskatoon and the Valkyries women's football team. Football has always thrived in the province of Saskatchewan way more than it has in any other part of Canada. Saskatchewan is best known as Rider Nation due to its love of the CFL's Saskatchewan Roughriders. As a spinoff, every other level of football in the province has benefitted from strong support. When Saskatoon got a team in the then newly formed Western Women's Canadian Football League in 2011, one had to expect there was a good shot the club would be popular. It was still surprising to see how quickly the Valkyries found their niche and became cemented into the community. Women from all walks of life flocked to the club to play tackle football. The team includes a vast number of players, who participated in other sports. The team includes players who are students, teachers, nurses, business professionals, tradespeople and hold down numerous other positions in the working world. Jeff Yausie, who is a veteran assistant coach with the Saskatoon Hilltops of the Canadian Junior Football League, was brought in early on to be the Valkyries head coach. He added a number of assistants, who mostly had backgrounds of playing football for the Hilltops or the University of Saskatchewan Huskies, to provide steady guidance. With a coaching staff that could oversee a junior or a university program, the Valkyries took off and have won all four WWCFL titles that have been awarded to date. The fans came out early on in that first year, and they haven't gone away. Exposure was also aided thanks to the fact the WWCFL plays almost all its games during the months of May and June. The Saskatoon sports scene experiences a lull during that time period, which has allowed the Valkyries to capture some extra attention. Valkyries LB Aly Bell (#25) tackles Wolfpack FB Jana Taylor. On Sunday, the Valkyries opened their 2015 campaign hosting the Winnipeg Wolfpack. After playing their home games for four seasons at Griffiths Stadium on the campus of the University of Saskatchewan, the Valkyries moved to the recently renovated Saskatoon Minor Football Field. A new massive clubhouse complex is also being built for the Saskatoon football community at the park that was formerly known has Gordie Howe Bowl. The Valkyries are used to playing in front of crowds of about 1,000 people, and a large gathering of supporters close to that number were present at SMF Field. The defending WWCFL champs entered the campaign without a couple of key players. Quarterback Candace Bloomquist, who led the team to their four league titles, retired after the 2014 championship win. Running back Julie David, who was the club's all-time leading rusher, is off exploring Europe and won't be with the Valkyries this season. Those departures raised some question marks, but those question marks went away early in the season opener. Returning after a one-year absence, tailback Julene Friesen showed she hadn't lost any of her blazing speed opening the scoring on a 46-yard romp. Stacey Boldt, who takes over as the Valkyries starting quarterback, hit veteran receiver Marci Kiselyk for 30-yard TD strike for a second major. Just over 40 second later, Valkyries fourth-year linebacker Denise Kolosky blocked a punt and Kiselyk recovered the ball in the Wolfpack end zone for another score. Friesen zipped home on a 62-yard TD run on a pitch out and Boldt ran another score in from 17 yards out to give the Valkyrie a 32-0 lead just eight minutes into the contest. The hosts romped to a 75-0 victory, which was also their 17th straight win at home. Receiver Carly Dyck hauls in a Valkyries TD catch. The veterans weren't the only ones that turned heads. Gritty second year running back Sam Matheson had ran in three scores before halftime. Receiver Carly Dyck, who is in her first year with the team, contributed a couple of nice plays in the fourth quarter scoring on a 28-yard run and a 40-yard reception. The Valkyries are calling this their "drive for five" season, and you have to like their chances of accomplishing that goal. They will likely be strong for the foreseeable future. They host annual tackle football camps for girls and the team's staff and players are active in helping run girls flag football in the city. Some of those girls will likely play for the Valkyries one day. Women's tackle football is still in its beginning stages, but the Valkyries are already thriving with a rich legacy. It is a story that fits right into the football lore of Saskatchewan. If you have any comments about this blog, feel free to email them to stankssports@gmail.com. To see more photos of the Valkyries regular season opener, check out Twitter @StanksSports. Logan Fischer runs the ball at the Hilltops spring camp scrimmage. Love for the Hilltops junior football club is alive and well in Saskatoon, and it feels like that might be something that never changes. As the population of the Bridge City and surrounding suburbs has ballooned to 300,000 due to an influx of at least 50,000 people over the last nine years, the Hilltops still have a loyal fan base. The supporters might not always be present for games at Saskatoon Minor Football Field, which was known as Gordie Howe Bowl for most of its life, but they are alert to what the team is up to. On Oct. 26 of last year, the Hilltops hosted another Prairie Football Conference title game and looked dynamic in disposing of the surging Calgary Colts 27-7. An appreciative crowd of 1,014 cheered the blue and gold to victory that day. While the Hilltops have played before much bigger crowds in their history, news of their win and the fact they advanced to another national final spread quickly over social media lines. Soon, the Hilltops were the talk of the town. A day after that victory, they hosted the Riderville North Quarterback Luncheon in conjunction with the CFL's Saskatchewan Roughriders at TCU Place. The event was packed, and it gave the Hilltops a warm kick off towards two weeks of preparation for the CJFL title game, the Canadian Bowl. The Toppers proceeded to travel to Langley, B.C., where they disposed of the host Rams 39-14 on Nov. 8. A healthy following of supporters made the trip to B.C. to witness the championship victory. 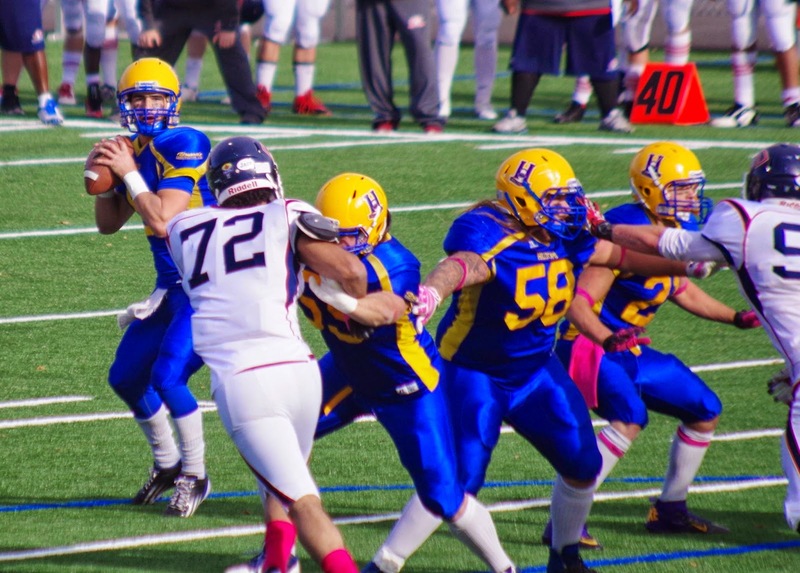 The Hilltops offensive and defensive lines battle in the trenches. On Sunday, the Hilltops hosted a Blue and Gold scrimmage game at Saskatoon Minor Football Field to conclude a three day spring camp. The scrimmage attracted a large gathering of supporters. The followers won't go away. The storied franchise has won 17 Canadian Junior Football League championships since the modern version of the club was formed back in 1947. The Hilltops actually appeared in their first national final in only their second season falling 14-10 to the host Hamilton Wildcats in the 1948 title game. Saskatoon would capture its first national title in 1953, when the Hilltops thumped the Windsor AKO Fratmen 34-6. Since that first win, the Hilltops have captured at least one national championship in every decade that followed. When Tom Sargeant became head coach in 1998, the Hilltops would go on to win eight of their national titles, including four in the last five years. Pretty much every generation that has grown up or moved to become part of the Saskatoon community has a memory of a Hilltops championship run. In a lot of ways, the Hilltops symbolize how the citizens of Saskatoon like to see themselves. The Hilltops work hard, carry themselves with respect, are disciplined and are tough. Davis Mitchell hauls in a pass. The tough aspect is something Saskatoon citizens really love about the Toppers, who play their contests out of what is considered the tougher part of town in the city's west side. The reverence for that characteristic of the club is similar to the reverence citizens of Pittsburgh have for the blue-collar Steelers of the NFL. Saskatoon residents have enjoyed the fact the Hilltops have fielded tough as nails players like Ron Atchison and Larry Wruck in their distance past and Jorgen Hus and Graig Newman in recent years. They can also win with flare and style. Sheldon Ball called signals for an explosive and dynamic offence for the team as a quarterback in the 1990s. He has now been the team's offensive coordinator for about a decade, and the players he guides can put up points in a hurry. That was seen last year when starting quarterback Jared Andreychuk put up 300-yard passing games in the PFC final and the Canadian Bowl, when the Hilltops looked fairly smooth. During the 1980s and early 1990s, the once very healthy CJFL saw a number of franchises fold. It was once the premier league for amateur football in Canada, but it hasn't held that distinction for at least four decades. Over that time, the Hilltops have remained healthy. A hard working board of directors has ensured the team continued to be a first-class franchise. Going into the 2015, the Hilltops will return most of their players from the year before. Only four players exhausted their eligibility following the 2014 campaign, and a handful veterans will be displaced by incoming rookies. Optimism is high the Hilltops will have another exciting campaign. Their loyal following will be there, and hopefully, they can share news of the team's exploits to attract new followers. That will ensure the team will be engrained in the community's fabric for decades to come. Mitch Hillis sprints downfield at the Huskies spring camp scrimmage. The University of Saskatchewan Huskies football team knows all they can do is worry about the present and not worry about the recent past. The Dogs concluded their spring camp with a Green and White scrimmage on Sunday, and they went through the weekend just focusing on the business at hand. The annual Dogs' Breakfast on Thursday morning opened the weekend's festivities as 25 new recruits were revealed to a crowd of about 2,000 at Prairieland Park. Most of the roster from the squad that went 6-2 during the 2014 regular season will return in 2015, and the returnees looked good. In the early going, the Huskies have to be considered a favourite to win the Canada West title. When thoughts turn to the post-season, expectations get tempered. U of S has lost its last six straight playoff contests and is 1-9 in its last 10 post-season games. They last won the Canada West title in 2006. The Huskies improved steadily during the course of last season and hosted their first playoff game since 2010. They took a 37-18 lead in the third quarter of a Canada West semifinal contest against the U of Manitoba Bisons, but the Bisons rallied for a 47-39 victory. The comeback came because the Bisons scored 14 points off a pair of interceptions including a pick-six, a major coming off a blocked punt, a field goal off a fumble and a safety caused by a bad long snap. During the spring camp, not much was said about the post-season implosion against the Bisons. The Huskies players and coaches just focused on getting better and getting the newcomers used to the team's systems. Drew Burko unloads a pass at the Huskies spring camp scrimmage. Veteran quarterback Drew Burko, who is entering his fourth year of eligibility, looked good during his reps in the scrimmage. Second-year signal caller Kyle Siemens looked really good. The offence once again has a huge stable of standout running backs. The defence also came through with big stops, and it will be anchored by veterans like linebacker Dylan Kemp and defensive back Chris Friesen, who will both be entering their fifth and final years of eligibility. The biggest addition is linebacker Justin Filteau, who starred with CJFL's Hilltops. When main training camps rolls around August, the Huskies have to follow the old cliché in taking each week as it comes and also hope the injury bug is kind. When the post-season arrives, it is expected to be a wide open with regards who could win it all, because most of the other teams in Canada West have gone through big changes in the off-season. The Huskies continuity might give them a big edge. If you have any comments about this blog, feel free to email them to stankssports@gmail.com. To see more pictures of the Hilltops and Huskies respective scrimmages, check out Twitter @StanksSports.